Evelyn Krahn did not curl during her High School years; she was too busy with other sports. However, she did start curling in 1952 at the Hodgeville Curling Club and the rest is history. Ev developed a love of curling and she continued curling wherever life took her including in Herbert, North Battleford, Swift Current and Toronto. In 1969 she moved to Regina and began curling at the Regina Curling Club where she curled until the rink was closed. She then moved to the Tartan Curling Club where she continues to curl twice a week. It was in Regina that she began to make her mark in woman’s curling. Her team represented her club in the Region Women’s Playdowns for 19 consecutive years from 1970 through 1989. It wasn’t until 1983, however, that they qualified for the Northern Playdowns. They went on to qualify for the Provincial where they lost the final to Sheila Rowan of Saskatoon who went on to represent Saskatchewan at the Scott Tournament of Hearts. Ev also had some success in Mixed Playdowns as well; winning the Regional Playdowns four times. In 1973 Ev won her first Provincial Championship. Curling third for a Team skipped by Sam Richardson with Glenn Hall at second and Elsie Hunter playing lead they won the Provincial Mixed title. They went on to play at the National Championship in Charlottetown, Prince Edward Island where they were runner up to the Barry Fry Team from Manitoba. The same team would lose the Provincial Final in 1978 To Bernie Yuzdepski from Saskatoon whose team would go on to win the Canadian Mixed Title. What was next? Seniors Curling! Evelyn Krahn and her teammates, Third – Twyla Widdifield, Second – Shirley Little and Lead – June Kaufman dominated Saskatchewan’s Provincial Senior Women’s Curling. After losing in the Provincial Final in 1980 and 1981 the team won six straight provincial titles, 1982 – 1987 inclusively, winning 67 and losing only 5 games at the regional, southern and provincial levels. During their six years of competition the foursome set records in senior ladies curling by winning six provincial and three consecutive Canadian titles in 1984, 1985 and 1986. They were also runners-up in three national championships. The team established an enviable record of 52 wins and 9 losses in national competition. At the national finals in Yorkton in 1985 they were undefeated. In 1974 Eve got involved as a volunteer serving as a Director of the Regina Curling Club from 1974 to 1978. 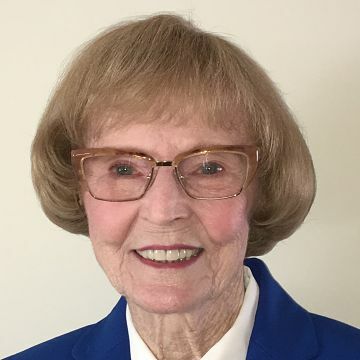 She would go on to serve on the Saskatchewan Ladies Curling Association from 1984 to 1986 and the Canadian Ladies Curling Association from 1985 to 1987. In 1989 she became a Director on the board of the newly formed Canadian Curling Association and served as its President in 1994. Among other contributions Eve has served on the Board of Directors of the Canadian Curling Hall of Fame, the Saskatchewan Sports Hall of Fame & Museum and the Marj Mitchell Foundation. She has also volunteered to assist with the Regina Ladies Bonspiel, the Regina Youth Bonspiel and has been part of every National and International Championship held in Regina. Ev was inducted into the Saskatchewan Sports Hall of Fame in 1988, the Canadian Curling Hall of Fame in 1989 and the Regina Sports Hall of Fame in 2005. Her team was inducted into Saskatchewan Legends of Curling in 2004 in recognition of their three National Championships. A true curling Legend, we welcome Evelyn Krahn into the Saskatchewan Legends of Curling as a Curler and a Builder.